Where do Erosion and Deposition Occur on a River? We now know that the faster a river is flowing, the more sediment it carries, and the more erosion it causes. But, not all of the water flowing in a river is moving at the same speed. 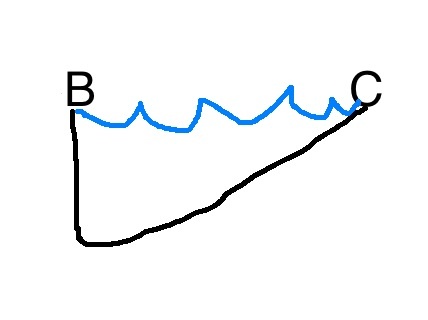 The areas of the river near the banks and the bottom are slowed down by friction. THE FASTES PART OF A RIVER IS USUALLY IN TH MIDDLE AND JUST BENEATH THE SURFACE. A river flowing down a straight path will be moving the fastest in the middle of the river, just below the surface. But if that river approaches a bend, the speed changes. It can be tricky to identify which side of a river bend is the outside and which is the inside. To do this correctly we use the elbow test. To do the elbow test you just need to bend your elbow to look like the bend in the river. The outside of your elbow is the pointy boney part. The inside of your elbow is the part on your inner arm. If you match your elbow to the river the outside part of your elbow will line up with the outside part of the bend. The elbow test is a foolproof way to identify the inside and outside areas of a river bend, which in turn tells us where the fast and slow moving water is. 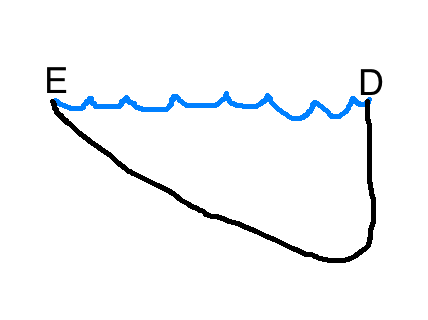 THE SLOWER INSIDE PART OF THE BEND IS WHERE DEPOSITION OCCURS ON A RIVER. Now that we know where erosion and deposition occur along a river, we can make predictions about how the stream bed will look. The Regents exam will most likely require you to draw the profile, or shape, of the stream bed. If the river is not bending, then erosion and deposition happen equally on all parts of the stream bed. Because erosion occurs on the outside bend, this side of the river is constantly being worn away. Because deposition occurs on the inside bend, this side of the river always has rocks piling up. 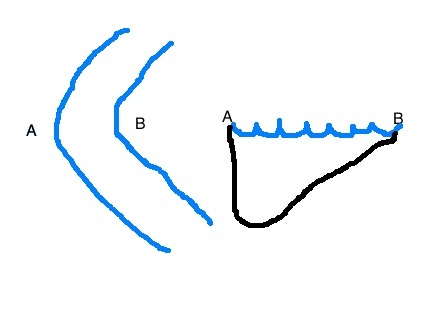 Lets Practice: Draw the stream bed profiles based on the diagram below.